In this episode, we cover how to find products to sell on Amazon. What are the characteristics of a bestselling Amazon product? How to use the Jungle Scout Database, Product Tracker, and the Chrome Extension to find top selling products with low competition? FREE Million Dollar Case Study workbook at the end! This is the Million Dollar Case Study. What to sell on Amazon? How to find products to sell on Amazon? How to make money on Amazon? We’re covering all of this today in our second episode of the Million Dollar Case Study. Watch the video, keep reading and don’t forget to download your FREE MDCS Workbook at the end of this blog post! Welcome to the Million Dollar Case Study! Welcome to The Million Dollar Case Study: Season 4, Episode 1. If you’re not familiar with The Million Dollar Case Study this is where we build and scale a physical products company to $1 million in revenue. All of the proceeds we earn from our products go to a charitable cause. We do everything publicly and fully transparently. This is Season 4, which means we’ve done this three times before. In Season 1 we launched the bamboo marshmallow sticks. In Season 2 we launched the hooded baby towels. In Season 3 we launched the Jungle Slumber sleeping bags and this is Season 4 where we are kicking it up a notch and doing things a little bit differently (more on that in a moment). 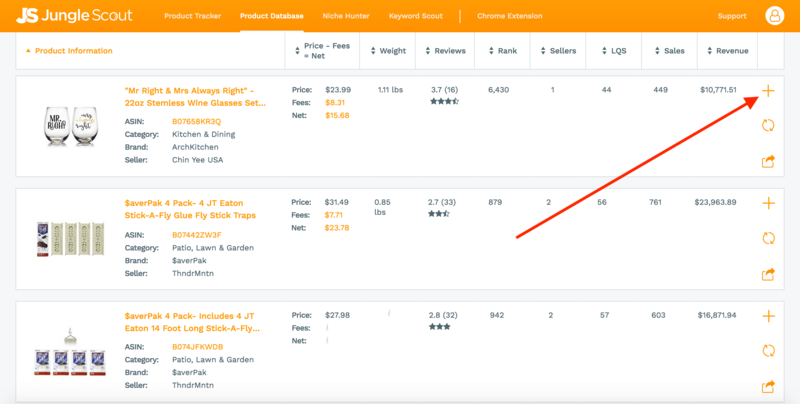 By the end of this blog post, you’re going to know exactly how to find profitable products to sell on Amazon, how to track those products, and how to quickly and effectively do product research. What does it take to have a successful product on Amazon? What kind of characteristics do these successful products have? This season we coined the term Customer Driven Innovation™. This product research strategy is halfway between an invention and private labeling. It leverages Jungle Scout to find products that sell well, but are lacking key elements or features to make them truly appealing to users. It involves looking at sales, ratings, and reviews. But don’t be overwhelmed by this. You don’t need to be an inventor or some market research guru. We are just going to physically give this feedback to our factories and we’re going to work with them to make these improvements to the products. We are looking for a product or niche on Amazon that the top 10 sellers have at least 2,000 sales per month. This is very important because often times, where beginners fail, is that they try to sell a product on Amazon that they think will do well because of a hot tip they received from a friend or family member or that they found online, however, that’s a very dangerous way to go about selling products on Amazon. Instead of trying to guess what people are going to buy on Amazon, we can just go into Jungle Scout and we can figure out exactly what people are purchasing. You should look for strong minimum sales for each product, play with numbers like 250-500 minimum sales per month. You can use Jungle Scout to make your product research faster and easier. Click here! The best way to gauge the level of competition is to look at how many reviews your competitors have and how many people are selling a very similar product. Now, in the top 10 sellers I like to find three or more that have less than 50 reviews and if I look at the first page of results for my product I don’t want to see everyone selling the exact same product. If you were to search the term “garlic press” or “yoga mat” or some other products right now what you would find is it’s very difficult to differentiate your product from everyone else. The whole first page results all look the same and this would indicate that this is a very competitive market that’s hard to get into. Furthermore, I’m looking for something in the top 10 sellers that has three or more sellers that have 50 or fewer reviews. If all of the sellers have hundreds or thousands of reviews that means this is a very competitive market. Those sellers and listings have been around for a very long time and it’s not one that I recommend you get into. You also need to find a product with good margins. If you’re selling an item for eight bucks or 10 bucks, after Amazon fees and getting it into Amazon and marketing, it’s hard to make more than a dollar or two on those. We want to be selling products that are more expensive, let’s say $18 or more because those tend to have better margins and just the overall profit per unit tends to be higher. If you’re selling 10 units a day and you’re only making a dollar each, that’s only $10 a day in profit. In comparison if you’re making five dollars or eight dollars profit now you’re making $50 a day or $80 a day, which is a lot more and just adds up a lot quicker. Since this is the Customer-Driven Innovation™ Edition, we would like to see one or two sellers that are selling at least about 200 units per month that have a 3.7-star rating or worse. We’re using 3.7 stars because that shows up to the customer as 3.5 stars and that’s a pretty bad rating on Amazon. I don’t know about you but I don’t ever purchase anything on Amazon if it doesn’t at least get 4 or 4.5 stars. So the fact that people are still purchasing a lot of these units even though they get rated very poorly on Amazon is a great indicator to us that we can make improvements on this product and sell a lot better than these other competitors. This is also just a timeless business strategy. Take the products that people are looking for and purchasing even though they don’t like them very much, improve upon it, and then sell it to that same crowd. This is something that will never go out of style. 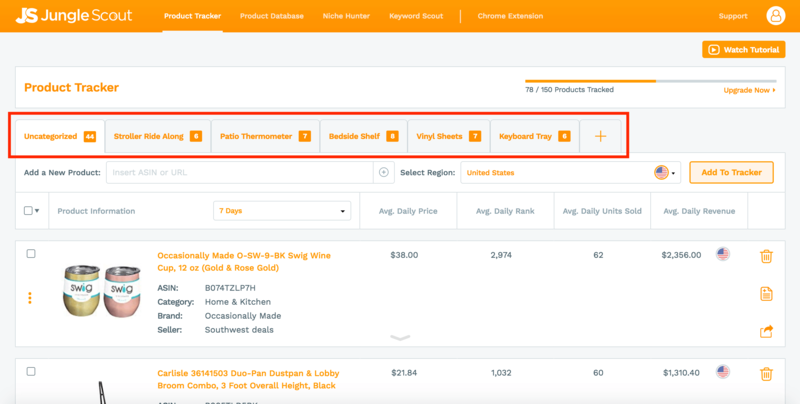 The Product Database is essentially us rebuilding Amazon’s entire product catalog in a way that’s user-friendly for sellers to search through and will allow you to do all this searching and filtering that’s beneficial to you as an Amazon seller. In the image below, you can see the categories I’ve left us to work with. 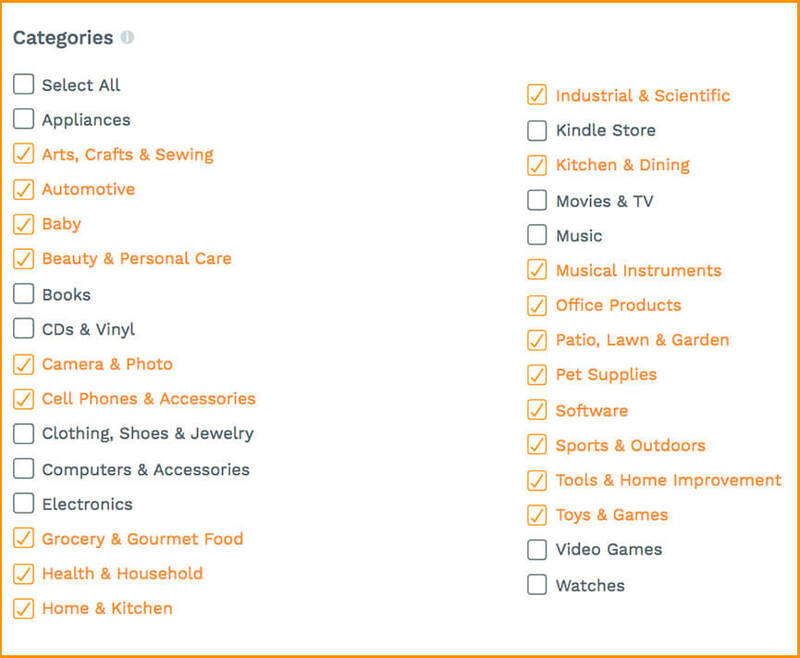 These are some of the product categories with the best potential for private label products for Amazon FBA. And Voila! Like magic, we have our curated list of product ideas! We started with tens of millions of products and this search has narrowed it down to thousands. That’s still a lot of products but the idea here is to quickly scan through this filtered list. 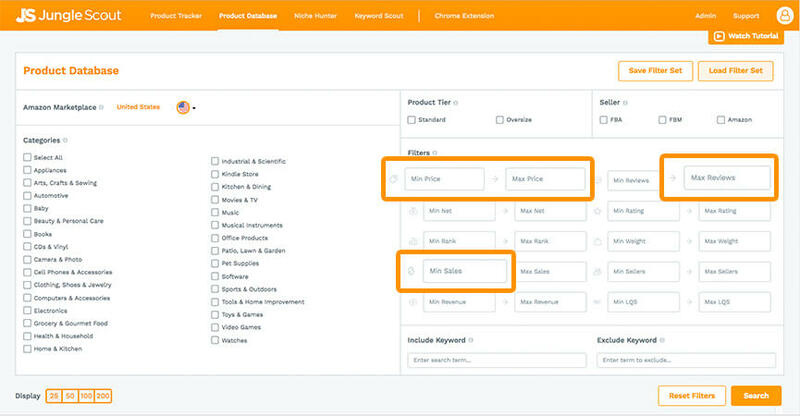 Whenever you see a product you like the look of (and the data for), collect them in your Product Tracker. Get access to the Jungle Scout Product Tracker right away! Now, what this will do is this will track these products for you on a daily basis. I can actually look back for previous information and see how many sales this product has had each individual day. Over time, you can see these products and see how many units are selling on a daily basis. You can see if there’s any kind of seasonal trends, or maybe if they do a promotion that day and the sales are artificially inflated. So, this is very beneficial to do. 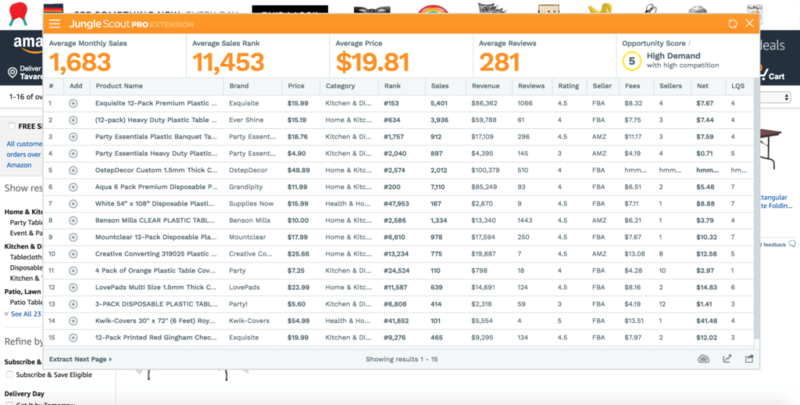 As I’m going through these products I come up with as many product ideas as I can, and then I would have a bunch of tabs along the top of the Product Tracker, and place all the products inside of those categories that correspond to them. This keeps your categories very neat and tidy. Ok, now we’re getting somewhere. What do we do next with all of these fabulous product ideas? Well, the idea is we begin to dive deeper and validate these ideas even further. I’m going to do that with the Jungle Scout Chrome Extension. The Jungle Scout Chrome Extension helps to really speed things up when it comes to product research. Within a few seconds, I can see all of the products on the first page, I can see all the product names, I see the price, I see the rank, I see the unit sales per month, which is very valuable information. I see things like the number of reviews and the star rating, and I also see how much money is left over on these products, after Amazon takes their cut. In the example above you can see the results generated when I ran the Jungle Scout Chrome Extension on the keyword “plastic table covers”. Remember, I’m looking for at least about 2,000 units sold among the top 10 sellers, and ideally, there’s not just one seller selling all of those units. Some other things to note just real quickly is you could also click on the rank inside of the Jungle Scout Chrome Extension, and this shows you how the rank has trended. So, I can zoom in on this. This is just the best sellers rank in its parent category, so, I can see how this has trended over the years or seasons. I could also click on the price to get a gauge of its price over the years. While we’re on the Chrome Extension, there are a couple of other just quick little notes. I can go into the columns, I can adjust which columns are being displayed. So, it can also show you things like the number of sellers, the dimensions, the weight, it can show you the sponsored products. I can also filter in here to say, “Hey, only show me the products that are selling at least,” let’s say, “1,300 units per month”. Lastly, let’s take a look and see why some of these plastic table covers are getting bad reviews and see whether or not we can improve on these products and work with the factories to improve them. So, I just went into a plastic table cover listing. I’m going to click on the numbered reviews and then click on the one stars to read the worst reviews and see what people don’t like about this potential product. So, it’s pretty clear to me that the biggest problem with this particular product is the material is just too thin. Now, I’ve worked with a lot of factories in China, and I’ll tell you, the cost between a very thin plastic tablecloth and a thick plastic tablecloth actually probably isn’t very much and to get one of these very cheaply made is probably a quarter in China, and to get a heavy duty one is probably 30 or 35 cents. So, something like this would be very inexpensive to make improvements to it. So, this would be a good candidate for the type of product that we want to sell in Season 4. We want to read the poor customer reviews, figure out what we can do to improve on them, and then sell that type of product. Great Video. I love the enthusiasm. Your product looks great, does the Web App and Chrome Extension give the same end results. Meaning finding products to market or not to market. Very informative, but how do we get those products? How do I find the printable PDF versions of the episodes material? Depends on what you need. If you already have ideas that you’re trying to verify, you should get the Chrome Extension. If you need help with ideas, then get both the Web App and Chrome Extension. Even if you start with just the CE, you’ll probably need the Web App later for keyword scout, too. The Chrome Extension updates results weekly. Changes such as selling season and other things can affect your estimates. That’s why we recommend adding all your products to the product tracker in the Web App. Hi , is niche hunter better than this method for product research? If review scores are too high, also be wary. Still, a 7-8 opp score usually says that there’s still opportunity there. You just have to find your hook. Hi, I listend to your video in this serious, the first 3 so far, not sure which video is was but here is what you said “You should look for strong minimum sales for each product, play with numbers like 250-500 minimum sales per month.” My 1st question is do you mean that EACH of the top 10 sellers should be selling this many or do you mean that I feel I personally can sell that many per month.? To be a good niche, how many of the top 10 sellers should be selling items per month, just clarify that if you would. 2) How many units should we be looking to sell per day and what PROFIT per day per product is considered a successful product? Did you contact seller support? They should be able to help with that! On the extension tool, im checking a product which is looking good, but im kind of afraid that the ‘sellers’ are mostly AMZ. Do you think I should be concerned about it? It really isn’t any cause for concern. As long as you’re still considering the same things we look out for with any seller – the sales, reviews, and opportunity score. Just make sure you do your due diligence to research and feel confident in your decision. I buy the jungle scout web app to find products to sell but according to the videos we also need the chrome extension to confirm the choice of the product. How is it possible to confirm a product without the chrome extension if it s possible ? 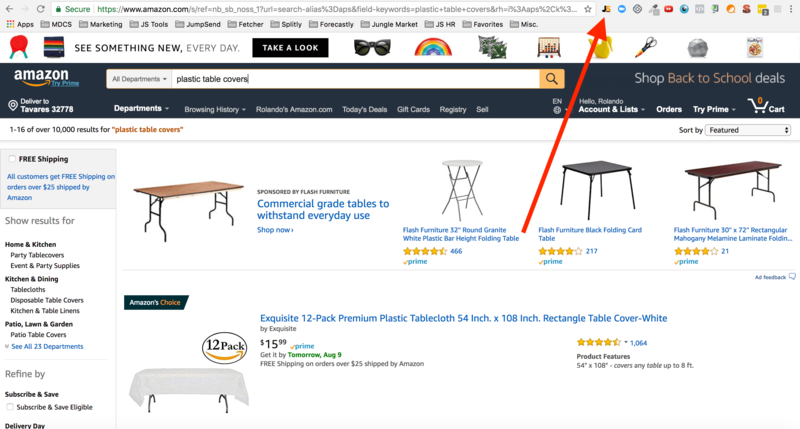 It’s a matter of going to the search engine results page on Amazon and using the Chrome Extension to confirm that those on the first page of the results’ numbers match up with the ones you have. 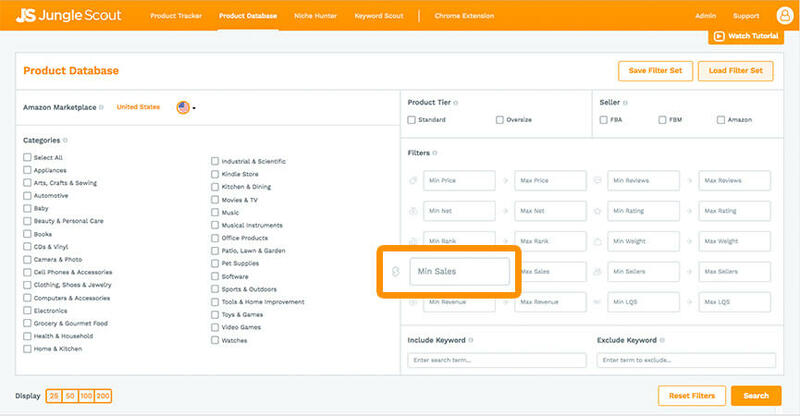 You can also do this by adding those same products to your product tracker and tracking it there. I just paid for jungle scout web app for search good products and it’s really simple for the first step but i would like to how can I confirm the choice of the products without the chrome extension. I will pay for it soon but not right now so if someone can explane me the way to confirm a product selection. Great video, but I do have a question I was hoping to get your opinion on. I’ve signed up for both the Chrome Extension and the Web App, and have been experimenting with both of them based on the guidance provided in this episode. I’ve noticed there seems to be a bit of a difference in how the two tools will rank potential product ideas. Here’s what I mean – With the Web app, the criteria that Greg suggests for researching products includes limiting review scores to 3.7 so that we get a list of products that can be improved upon. However, in experimenting with the Chrome extension by searching on dozens of categories right from amazon, the top ranked categories (Opportunity Score) all have average review scores of higher than 3.7. For example, out of all the search terms I ran the Chrome extension against, I got only two that were given a score of 8, and 1 that got a 9. All three of these categories fit the search criteria Greg gave for the Web App searches, EXCEPT for the review scores, which were all 4 or better. So my question is this: Should these 8’s and 9’s as ranked by the Chrome extension be discounted, just because the review scores aren’t 3.7 or lower? Thanks! At the top right of the CE there is a button that looks like menu bars. Click on that and you can create filters and set the reviews. It’ll strip out the products with higher review scores for you. Then, you can see what it says about the opp score then. Can I still sell and do Amazon FBA if I’m US resident but currently in the UK? Also can I work off my tablet/ipad with the JungleScout Web App? I just tried accessing the discount offer and it keeps giving me an error page, is this because I’m using a tablet and not a laptop or desktop computer? You can definitely sell on Amazon US from the UK. If you also happen to have a US bank account and mailing address, you’ll easily be able to set up your FBA business quickly. Just make sure you’re still able to receive product samples, or have someone in the states able to receive and do a quality check for you. As for the tablet issue – a tablet should be able to display the Web App nicely, but at this time the chrome extension is not supported on tablets. You’ll need a laptop or desktop computer in order to use that, which might be why you’re running into this issue if you’re trying to get the full Jungle Scout setup with the promo. for Canadian users should we search the Canadian products? or can we search American products too? Canada has about 1/10th the population of the US or the EU, so the Amazon site matches accordingly. You’re probably better off selling in the US or the EU. I am based in UK so would like to know following, so does the estimator at junglescout.com will only estimate for products in Amazon.com or can it do for UK store as well ? It can also do UK. You just have to change the settings. What happened to the international case study? Hi Just tried to test out the instructions to find sales estimates on Jungle scout and this is the reply for everything – Request not allowed. Are we not allowed to do that now? I would like to buy Chrome Extension PRO (Webb App + Chrome Extension) for 197. – is this 197 for lifetime for both Webb App+CHE? – is CHE PRO enough, if I would like to search profitable new product? – what is the difference CHE PRO (which I mentioned above) vs package which you offered within the opening of MDCS for 279? I would love to see this case study cover some new territory like a product bundle or sourcing in the USA. I agree with you Lisa, bundling is a very good idea, but how do you validate that type of product? how do you test it? For the category selection image, you should update and uncheck software given you stated to stay away from it. Can you make your blogs PDF document …it is more useful to have it printed then we right our notes on it. Not a bad idea! Maybe we’ll put them together into an ebook later on. Are you going to cover the ‘No Legal Issues’ criteria in detail later in the MDCS? It wasn’t covered in this article. I have Jungle Scout Web App and Chrome Extension. A detailed tutorial would be nice. I have been following along and using Jungle Scout products for a couple of months now, and I’ve gotta say, this is the absolute BEST resource out there for anyone who wants to learn more about selling on Amazon. Hands down!! I mean honestly, what better way to gain the skills and knowledge required than to watch it happen live and fully transparently? Not to mention 4 successful times in a row!!! No other product or team out there offers nearly as much insight and invaluable knowledge like the awesome team at Jungle Scout does!!! So here’s to all of the JS team, I offer my deepest thanks for all that you do and all you continue to do in your efforts to help others learn and grow!! I would be lost without you Jungle Scout!!! I do have the chrome extension,if I want to upgrade to pro what discout i get. Also what photo you need to share on facebook group for prize? The link to the facebook group is incorrect. It has “edit” at the end of the URL which takes you to the facebook home page.